Downstairs the main living area is open plan. There are two separate lounge areas with a double sofa bed and entertainment centre with flat screen TV in one section. 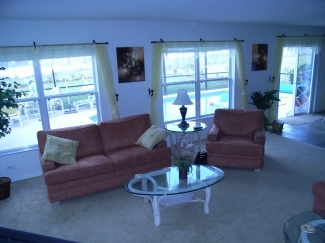 There are plenty of comfortable sitting areas and two dining areas. 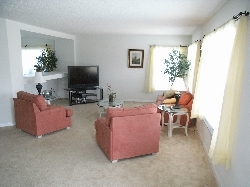 The fully equipped, large kitchen has a breakfast bar for quick snacks. From the kitchen and dining area patio doors lead out to the pool and garden. The pool has a removable child safety barrier and under-water lighting. There is a gas B.B.Q and garden furniture on the decking. There is also a shower room with toilet and utility room with a washing machine and drier. Upstairs the spacious master suite has a romantic, king sized, four-poster bed, a television,DVD player, full bathroom - with bath and walk in shower, and a large walk in closet/dressing room. 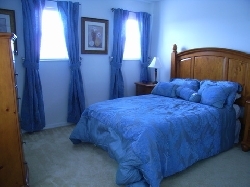 There is a second double bedroom with a television. Palm Trees also has an upstairs nook - an ideal quite spot to get away from the children ! 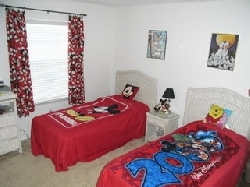 There are two twin bedrooms,one with Disney theme. There is a second full bathroom - with shower and bath. A cot and high chair are available if required at no extra charge. 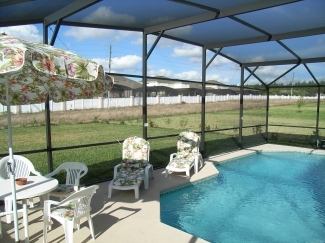 Palm Trees has a large private 27' pool - with optional heating. The decking area has loungers and table and chairs for out-door eating. There is a gas B.B.Q. The pool has a removable child safety net. 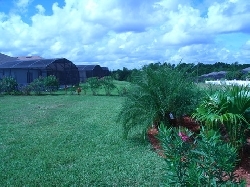 Beyond the pool area is a large lawned garden The large lawned area to the rear gives the pool an open sunny aspect. 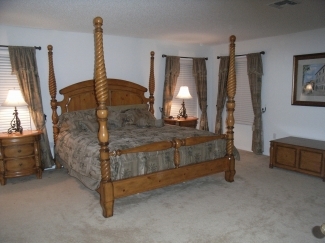 An ideal place to spend warm evenings, relaxing after a day at the parks or beach. 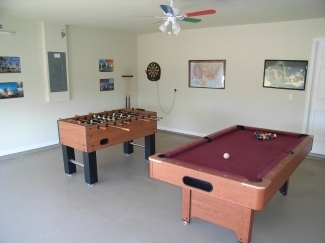 There is also a games room with pooltable, table football, darts, Playstation 2, etc.